The Green Man Sculpture relief for the Green Man Passage in Dudley. Strange name for a town passge? What is this about? 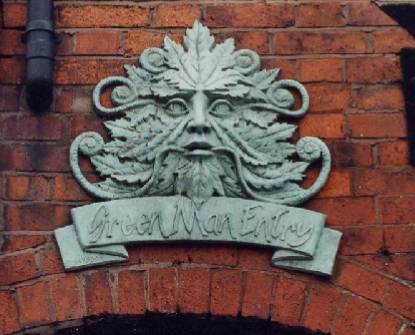 Green Man entry is a very old passageway in Dudley may have been an entrance to a former ale house. Commissioned for the town of Dudley in the west midlands by Steve Field of the Dudley Borough Public Art Unit. Above picture shows the Green Man sculpture relief insitu in Green Man Entry.